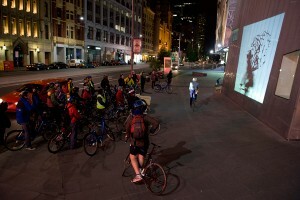 Projector Bike leaves Testing Grounds and takes a ride through the city, leaving at 6.30pm and returning for a drink at the bar. Showing award-winning short films with a fresh playlist every week, join us as we meander through Melbourne’s arts district. Bring your bike and meet at Testing Grounds, or catch up with us via Twitter updates. This is a free event for all-ages.